You guys. I FINISHED my reading challenge this month!! After last year's sad disappointment of only reading 29/50 books, I decided to take my goal down to 40 for 2016. Well, since I really made having alone time, and reading for pleasure one of my priorities for the year, I freaking killed it. So far I've read 42 books, and by the time the end of the year rolls around, I anticipate being closer to 50. I've learned so much about what I like to read, as well as how I like to read. I am seriously obsessed with audiobooks, and now that I can get them from the library, I am listening more. 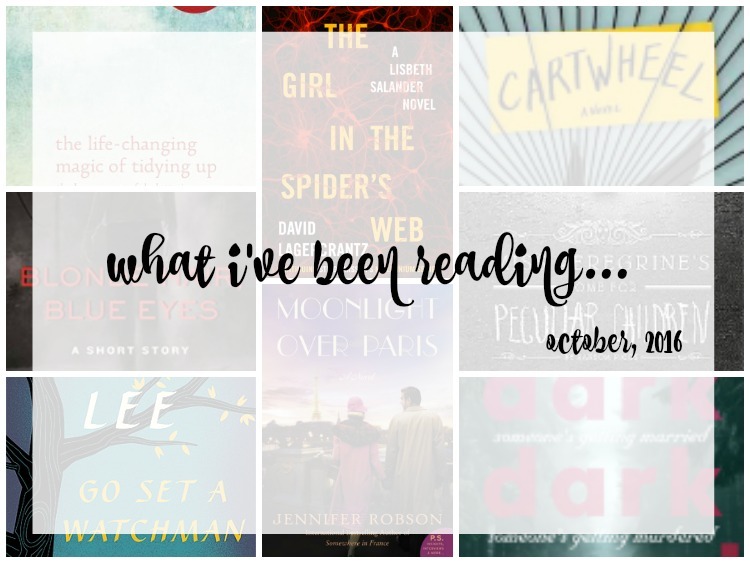 So I wrote September's book post a little bit early, and because of that some of these books were actually finished in September. There were some I loved, some that were sort of "meh" and some that I didn't finish because I was not interested AT ALL. Blonde Hair, Blue Eyes by Karin Slaughter ★★★ This is a short story that is a prequel to the book Pretty Girls. It tells part of Julia's story, the sister who went missing in Pretty Girls. She is a college student and has a very typical college life. It was pretty creepy to be reading this, all while knowing what happens to Julia in the end. It was interesting to see the parallels between her story, and the one she was researching. Cartwheel by Jennifer duBois ★★★ I read this for my first book club meeting in Pittsburgh! It is supposedly based on the story of Amanda Knox, but after watching the documentary on Netflix, the story is basically the same. Just a few details were changed. Lily is possibly one of the least likable characters I've ever read. She is rude, flippant, and very self-centered. Her characterization made it hard to have any sympathy for her. I really felt more for her parents and sister. Go Set a Watchman by Harper Lee ★★★ This book wasn't awesome, but I didn't hate it. I listened to a version with Reese Witherspoon narrating (which was cool). I just felt like there wasn't much driving force to the plot. 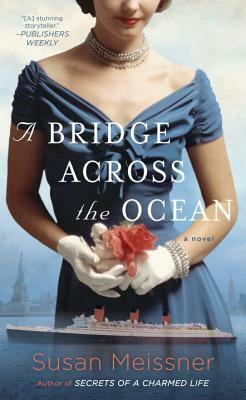 This is a beautifully written novel that is somewhat a sequel to To Catch a Mockingbird. I read that SO long ago, that I am not very familiar with it anymore, but I think that is part of the reason I didn't love this. I don't have an emotional attachment to the characters, and didn't always understand what was going on between Scout and the other characters. The Life-Changing Magic of Tidying Up by Marie Kondō ★ So many people have such strong feelings about this book, but honestly, I didn't like it at all. The "Konmari" method is basically keeping your space tidy by getting rid of clutter. You should only keep items that "spark joy." Honestly, there are tons of necessities that don't spark joy for me, but I'm not going to get rid of them? For example, I can't get rid of my socks, even though those don't spark joy. And what about compromising with the people you live with? Dave's record collection doesn't spark joy for me, but he freaking loves it. Just because I'm the one doing the tidying (most of the time) doesn't mean I get to toss that stuff. I just didn't like the whole tone of the book. It seemed very preachy and honestly that is unnecessary. Miss Peregrine’s Home for Peculiar Children by Ransom Riggs ★★★★ I read this so that I can see the movie soon, but at this rate, I'm going to have to wait for it to come out on DVD. This book was very quirky and cute, with the right amount of spookiness for the month of October. Even with all the fantastical elements of this book, I loved the plot. I loved the idea of Jacob switching between time, and helping the Peculiar children. Some things were a little bit too far fetched for me, such as the whole concept of the wights and hollowgasts. (I know, I know... time travel is fine, but invisible monsters is just too much. Who am I?). Moonlight over Paris by Jennifer Robson ★★★★ Reading about the lost generation is one of my favorite subjects in historical fiction. This book was a wonderful blend of romance, history, and a strong woman. I really liked Helena as a character and was rooting for her in art school as well as in her relationship with Sam. The one thing that I disliked is that the author wrote Sam as a trust fund baby when that was really unnecessary. I wish he had just been the poor reporter. I also liked that even though Helena failed at being a traditional artist, she was able to find and use her passion to create a career. In a Dark, Dark Wood by Ruth Ware ★★★★ This was my book club's pick for October. Almost everyone rated this book a 10/10, while I'm over here with a 7/10. 4/5 since I'm feeling generous. The plot was really good, but I didn't feel connected to the characters AT ALL. Nora was not a likable protagonist, and I would find myself questioning her decisions. Oh, you haven't talked to these people in 10 years, and she's marrying your ex?... WHY ARE YOU GOING TO THE BACHELORETTE PARTY? Oh, you want to go back and check out the house?... WHY WOULD YOU WALK THROUGH A BLIZZARD IN FLIP FLOPS? I was expecting a lot more from this. David Lagercrantz is continuing on the Lisbeth Salander story (which I have loved so far). I just think there is way too much going on in this. The NSA. A child savant. Crime organizations. A murder. Lisbeth's sister. It just gets to be very confusing. There also wasn't the thrill that you felt in the first three books. It just kind of plodded along. Right now I am reading two books for review, which is kind of weird. If any bloggers haven't signed up for Blogging for Books, or Netgalley, do that right now. 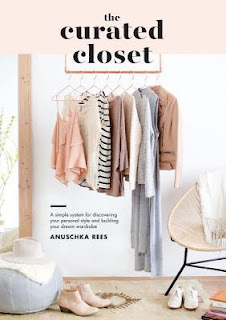 I'm currently reading A Bridge Across the Ocean by Susan Meissner, and The Curated Closet by Anuschka Rees.